Last night's annual T3 Gadget Awards, hosted by James Nesbitt at London's Intercontinental, Park Lane, managed to sift the gadget wheat from tomorrow's landfill chaff, with the teams from T3 magazine and T3.com celebrating the great and good of tech and gadgets from the last year. So who won the coveted Gadget You Can't Live Without, Gaming Gadget and the much-coveted Gadget of the Year awards? Read on and we'll let you know. 11 of the 16 T3 Gadget Awards are not picked out of a hat by the editorial team, but democratically chosen by over 54,000 votes from readers in order to pinpoint winners in each categories. Apple deservedly scooped four prizes – including Gadget of the Year, which was awarded to the Apple iPod Touch - while Activision's Guitar Hero scooped Toy of the Year. In eco-friendly tech terms, car manufacturer Honda won the Green Gadget category, with its innovative Civic Hybrid, while TomTom's awesome GO930 SatNav was named Gadget You Can't Live Without. 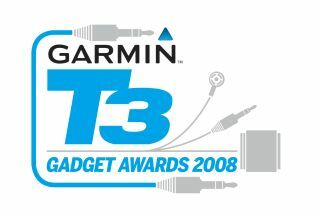 "The Garmin T3 Gadget Awards 2008 really do reflect the cream of this year's tech," says Michael Brook, Editor of T3 magazine. "And this is thanks to the T3 readers who voted in their thousands to sort the men from the boys. It's been important for us to have our readers involved in so many of the categories, since they are the ones using these products day in, day out, and can tell the hottest kit from the hype."